Samgyeobsal (pork belly) with soju, Pajeon (scallion pancake) with makgeolli (Korean rice wine) and cheese with wine: these are some of the staple pairings of dishes and alcoholic beverages that go hand in hand. Taking cue from the commercial effects of such dining culture, beverage makers and importers have been stepping up their marketing game by finding “the right” pairings of local dishes for their brands in a country where alcohol consumption is shifting towards quality rather than quantity. “While it was more important to boast about how much drinks one had in a night, it has now become important to talk about what kind of drinks one had,” said an industry insider, noting the changing drinking culture particularly among the youth. “People now also know that when premium beer comes with good food, it certainly tastes better,” he added. 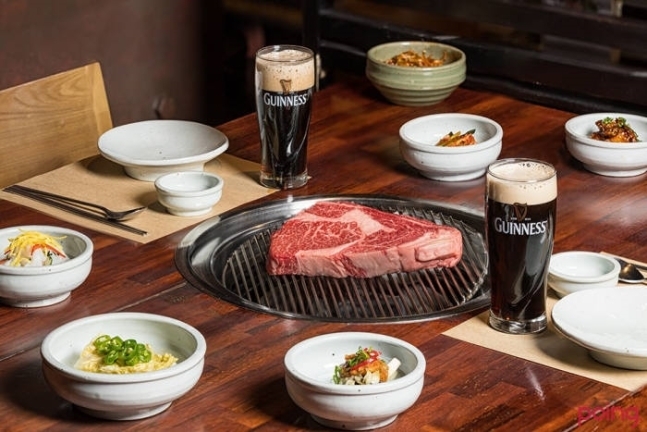 Diageo Korea promoted its Guinness stout at a recent food pairing event by partnering with local barbecue restaurants, to provide consumers with a special gourmet experience with barbecued beef, pork and lamb. “Guinness’s smooth and rich flavor deepens when paired with roasted barbecue. A pairing between stout and Korean foods will provide not only a unique experience to Korean consumers, but a differentiated taste of beer,” said a Diageo official. Diageo began importing and distributing Ireland‘s famed dry stout Guinness here in 2003, and sales of Guinness have seen double-digit growth annually in recent years. “While consumption of lagers are still exceeding those of ale or stout, the industry forecasts that sales of non-lager beers will see a 10 percent growth this year, following diversified import and distribution channels,” said an industry insider. As of last year, overseas beers -- of which the majority are ale or stout -- accounted for 13 percent of total beers sold in Korea. The import amount for foreign beers recorded $263 million last year, up 45 percent on-year. Other alcohol brands are also taking note of the consumer appetite for stout and dark beers. Local drinks goliath Hite Jinro has also recently rebranded its lager-style dark beer Stout to target those in their 20s and 30s, with a renovated taste for the lightness of black malt. The company said sales of Stout are on a steady rise, with about 22 million bottles sold a year. China’s Tsingtao beer, considered the perfect match for lamb skewers here, has also expanded its beer lineup for the first time with a stout and wheat beer since it entered the Korean market 18 years ago. In the same marketing vein as Diagio, local beer maker Oriental Brewery last year made waves by picking British celebrity chef Gordon Ramsay as a brand spokesperson for its lager brand Cass Fresh. Ramsay filmed a commercial at a Korean barbecue restaurant, where he praised the match of grilled pork belly and Cass Fresh. As soon as the commercial was released, the endorsement of the Korean lager by the star chef went viral online. According to OB, an accumulated viewership of 150,000 was recorded for the Cass Fresh ad featuring Ramsay over seven months. “We have seen positive effects following our collaborative work with chef Ramsay, also in terms of sales. That’s why we extended the contract with Ramsay in March to shoot another advertisement,” said an OB official. Video version of this article can be viewed at https://www.youtube.com/thekoreaherald -- Ed.